Inc Solutions provides secure, fast and reliable wireless network connectivity that’s easy to deploy. The infrastructure is light and installation is fast. So your users are connected sooner and the service income will start to flow before your DSL operating competitor installs its DSLAMs. Fast in deployment Working in service business you have sensed the idea of ‘Time is money’. 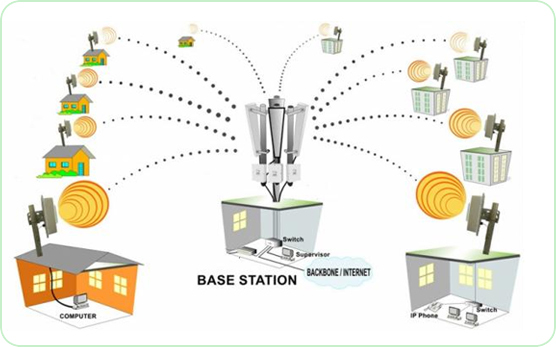 With Wireless broadband access solutions you will penetrate the market before others as you will start connecting your clients in matter of weeks after you decide to use this technology. Profitable Service clients are paying for the capacity of their connections and as you will be able to provide more bandwidth you will have more income. Also as you can connect clients in longer distances you will be the ultimate choice for clients who are not in the service area of your DSL operating competitors. Manageable With built in features like bandwidth management and QOS your clients are more manageable with less backbone equipment needed, reducing the total cost of your infrastructure. No more extra routers are needed to provide bandwidth management, QOS or VLAN. As all hosts behind each CPE are recognized in the base station you have total control over all aspects of your client’s activities on your network. Secure Built-in, hardware based, AES (Advanced Encryption Standard) encryption ensures uncompromising 128 bit security to prevent unauthorized access to your network.. Sophisticated and secure network management options ensure that only authorized personnel, from secure devices will be able to manage your network. Unauthorized technical people behind a CPE, even if a network genius, can not alter their service features. All they can do is to disconnect themselves from the network. Expandable As an all-IP solution, a Wireless broadband network is much easier to expand thanks to its modular and cell based system. Expanding your service to a new profitable area full of well paying clients is just few weeks away as all you need to do it to have a cell installed in the area and connect the cell your network through a high speed wireless backhaul. Reliable Inc Solutions wireless network solutions enable you to connect remote locations at a distance of up to 30 miles. They are ruggedly constructed to withstand harsh environments and have a proven reliability. Inc Solutions wireless broadband solutions utilize advanced OFDM non-line-of-sight (NLOS) technology to ensure reliability even in areas without line-of-sight and in extreme weather conditions. Sharable CPEs Each computer behind each CPE is recognized as a separate entity in the base station and the number of CPEs needed to connect your client is far less than the number of clients, as CPEs are sharable. Actually you need one CPE per location and within the location tens of clients can share the same CPE reducing the cost of CPE even lower than DSL in some cases. Compact Base stations With compact base station equipment and remote management features your presence is not limited to your offices or building you own. Roof top lease contracts will make any tall building a point of presence for you and from there you are few weeks away from connecting hundreds of new clients. IP Telephony With built in voice connectivity features recognizing voice as a different type of information flowing through the network and with CPEs having built in voice ports compliant with H323 and SIP protocols, voice service is just another source of income with almost no change to the data network.